Savi's Warbler showing pink legs, white chin, dark under-tale, you can just make out the curved outer edge of wings. Rare summer visitor; As few as 2 pair breeding in a small area of SE England, and estimate of only 500 pair breeding in scattered areas across central Europe. Sometimes appears in UK as a passage migrant. Preferred habitat is extensive wet reed beds. 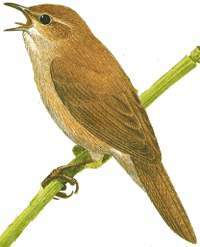 Although from a different Genus, the Savi's Warbler is very similar to the Reed Warbler and can be difficult to separate especially as they share the same habitat. The birds distinctive song is the best method of identification, along with the dark under-tail feathers, curved outer wing edge and pink legs.